In the latest in our #FindingHope series, we spoke to addicts who get together weekly to play poker, pool, and more at the Recovery Club of Nampa. NAMPA, Idaho — For many, maintaining a social life after getting clean from a drug addiction can be a challenging road where one wrong turn could lead to a relapse. In the latest in our #FindingHope series, we spoke to recovering addicts who get together weekly to play poker, pool, and more at the Recovery Club of Nampa. "Tonight was a great time." Pool, card games, karaoke--all things you might expect to see at your local haunt. "It's good to get back into sittin' down and hangin out with my friends," said David Pywell, club member and recovering addict. But despite typical bar activities, these patrons aren't here to get "liquored up." "Bars aren't safe, ya know? Here we can come and play poker, not be around other people that are using," said Theresa Johnson, club member and recovering addict. Because here at the non-profit Recovery Club of Nampa, folks didn't choose to be dealt the card of addiction--that's just the hand that they were given. "I needed to quit, I wanted to quit, I had to quit," said Pywell. "It doesn't matter how much I love my baby, how much I love my mama, how many years I got hanging over my head--I just couldn't quit." Theresa Johnson faced a similar struggle. "Meth was my drug of choice, but, when I didn't have it, I used anything--pills, marijuana," Johnson said. Even after getting clean, familiar temptations caused her to relapse. "I graduated Nampa High School, and so I didn't really have a safe place to go because it's--it's--Nampa was my drug town. It's where I used. Ya know? All my friends were here, cause most of them used." After 20 years sober and countless 12-step meetings, she and others are now partaking in local (and fun!) alternatives in recovery. "When the club was formulated it actually gave me somewhere to go where I could feel safe," said Johnson. "I came here and I found people that I didn't think were like me, and they were exactly like me. And they knew solutions to the problems I had," said Pywell. And just as in poker, those who make the best choices with the hands they're dealt are the ones who come out ahead. "Whenever you decide you wanna quit, we have a solution. We have a way out. Our message is hope and our promise is freedom." 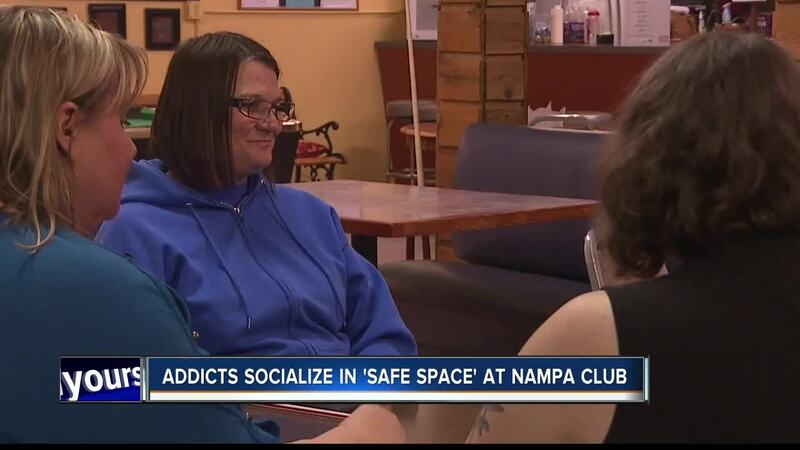 Learn more about Recovery Club of Nampa here .